Multi-Channel Systems - Sensors - Injection Molding | Injection Molding Training, eDART System, RJG Inc. Traverse City, Michigan, MI - RJG Inc. This low-profile, robust hardware system simplifies in-mold installations for molds with four or more sensors and saves real estate on the mold. 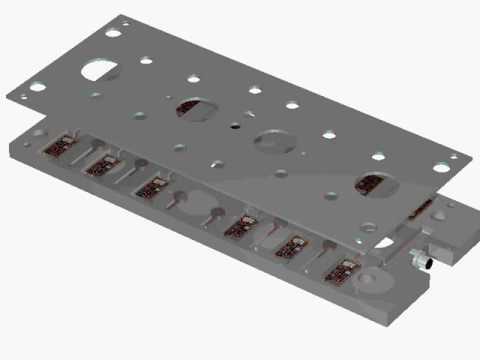 This multi-channel cavity pressure solution, unique to RJG, allows injection molders to connect up to eight strain gage sensors to one connection point on the mold. Injection molders who want to reduce the footprint of hardware on their molds or save costs over other multi-cavity sensor solutions in the industry can now use RJG’s Multi-Channel Strain Gage solution. The adapter resides on the molding machine, allowing technicians to move molds easily by disconnecting and connecting the connector cable. A Lynx cable then connects the adapter to the eDART® System. This low-profile, robust hardware system simplifies in-mold installations and saves real estate on the mold. 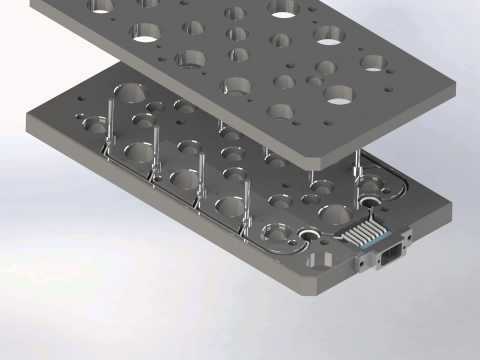 The multi-channel cavity pressure solution allows injection molders to connect up to eight piezoelectric sensors to one connection point in the mold. The interface with Mold-ID identifies the sensors and the mold to the eDART® System, so you can be sure you have the right mold running and the correct sensors selected. We put all the proven technology of Lynx™ digital sensors into the ejector backer plate with Lynx Embedded Sensors. The sensor electronics and head are entirely buried, eliminating outside cabling. Sensor locations and pin size files are pre-configured, making the setup that much easier. When the tool is hung in the press, all sensors are fully functional and properly named with a single cable connection from the mold to the eDART® System. The strain gage Sensor Plate with Mold ID allows users to interface up to 8 multi-channel strain gage sensors while maintaining a small mold footprint. Information on the old version of the adapter can be found here. Note: The MCSG-B-60-250 is currently a limited release product. It is only available via a custom product quote at this time. The 6 mm Strain Gage sensor is a robust, indirect (under the pin) pressure sensor that works in conjunction with the eDART® System. The 6 mm sensor head is the smallest strain gage sensor available, permitting the use in molds that may have tight clusters of pins with limited room. The sensor is designed with a head that matches the dimension and installation pocket of the Piezoelectric 9211 6 mm button. That means it contains all of the capability of the Piezo at a more cost effective price. Unlike Piezo, though, the connector cables can be bent and folded without damage, making them more flexible and easier to maneuver around obstacles. A ½” button, Multi-Channel Strain Gage, indirect (under the pin) Cavity Pressure Sensor that can withstand a force range of 500 pounds and a maximum temperature of 250 degrees Fahrenheit. Sensor lengths over 48” are an additional $50.00 each. A ½” button, Multi-Channel Strain Gage, indirect (under the pin) Cavity Pressure Sensor that can withstand a force range of 125 pounds and a maximum temperature of 250 degrees Fahrenheit. Sensor lengths over 48” are an additional $50.00 each. A ½” button, Multi-Channel Strain Gage, indirect (under the pin) Cavity Pressure Sensor that can withstand a force range of 2,000 pounds and a maximum temperature of 250 degrees Fahrenheit. Sensor lengths over 48” are an additional $50.00 each. The 5/8” Multi-Channel Strain Gage, indirect (under the pin) Cavity Pressure Sensor that can withstand a force range of 4,000 pounds and a maximum temperature of 250 degrees Fahrenheit. Sensor lengths over 48” are an additional $50.00 each. The Piezoelectric Connector with Mold ID allows users to interface up to four RJG piezoelectric sensors while maintaining a small mold footprint. The unique cable connecting system allows for easy field replacement of cables and sensors with minimum nuisance or expense. The interface identifies sensors and molds on the eDART® System so you can be sure you have the right mold running and the correct sensors selected. Attention! PZ-4 Version 2 requires a deeper pocket depth, please review installation drawings carefully. If needed, a spacer is available. The Piezoelectric Connector with Mold ID allows users to interface up to eight RJG piezoelectric sensors while maintaining a small mold footprint. The unique cable connecting system allows for easy field replacement of cables and sensors with minimum nuisance or expense. The interface identifies sensors and molds on the eDART® System so you can be sure you have the right mold running and the correct sensors selected. Attention! PZ-8 Version 2 requires a deeper pocket depth, please review installation drawings carefully. If needed, a spacer is available. The Lynx 4 Channel Piezo Adapters provides piezoelectric cavity pressure sensor users with a convenient, simple interface to 4 channel piezoelectric systems. The Lynx Eight Channel Piezo Adapter provides piezoelectric cavity pressure sensor users with a convenient, simple interface to 8 channel piezoelectric systems. A 3' cable for PZ/LX4F-S.
A 3' cable for PZ/LX8F-S.
A sensor cable for PZ-4/8. Available lengths include 0.1m, 0.15m, 0.2m, 0.25m, 0.3m, 0.35m, 0.4m, 0.6m, and 0.8m. Longer lengths of 1.2m, 1.6m, and 2.0m are available for an additional $50.00 USD each. The Lynx™ embedded sensor electronics and head are entirely buried, eliminating outside cabling. The plate includes a single connector for up to 30 sensors, and locations and sizes of the sensors are pre-configured, making setup that much easier. When the tool is hung in the press, all sensors are fully functional and properly named with a single cable connection from the mold to the eDART® System.